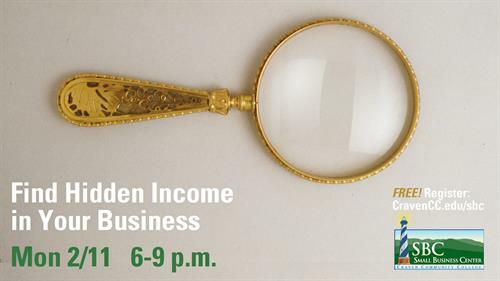 Find Hidden Income in Your Business! Name: Find Hidden Income in Your Business! Small business owners often sacrifice their own income requirements to ensure their businesses succeed. In this class, we'll use an outsiders look at your business and marketing assets, how they're currently deployed, and how to maximize your opportunities while reducing as many time consuming or unprofitable activities or commitments as possible. Business owners will leave this class with a basic audit document to use to audit their businesses, knowledge of the three places additional profit is typically hidden within their businesses, A plan to discern every upcoming opportunity within their profit, time, and marketing benchmarks understanding how outsourcing or hiring part-time may actually increase their income. The #1 way to maximize the relationship with your clients/customers!